February 15, 2016 – Today’s destination is America in the 1870s, and our guest is Sheila Myers, author of the novel Ephemeral Summer, and associate professor at Cayuga Community College. 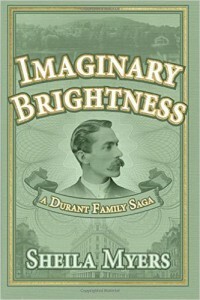 Her latest novel is Imaginary Brightness: a Durant Family Saga . At the dawn of what Mark Twain would later dub the Gilded Age, the economy suffered a panic — what we’d call a depression — brought on, in part, by over-speculation in railroads. Dr. Thomas C. Durant, head of the Union Pacific Railroad, was one of those tycoons devastated by the crash. Imaginary Brightness tells the story of his children, William and Ella, whose world is turned upside down by the crash as they’re torn away from their privileged lifestyle in high society London, and stuck in the wilderness of upstate New York’s Adirondack Mountains. You can follow Sheila @SheilaMMyers on Twitter, or visit her online at wwdurantstory.com.